Earlier known as Medantakpur, this town was also known as Medanipur in ancient times. It flourished during the Pratihara period and was in possession of Rao Duda of Jodhpur in the 15th century. This fortified town has many old temples and mosques. 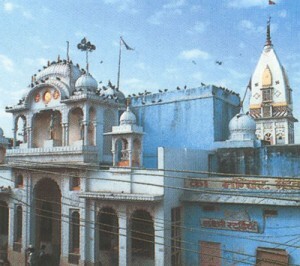 The temple of Charbhuja is in the midst of the town. This famous temple is associated with the princess Meera Bai, the mystical medieval poetess. The other points of interest in this town is Dudsagar or the ‘lake of milk’. The ashram of Mauni Baba or the silent sage is visited by many devotees. There are magnificent cenotaphs dotting the nearby plains. This entry was posted in Merta, Rajasthan and tagged Charbhuja Ji Temple, Meera Bai Temple, merta city. Bookmark the permalink.